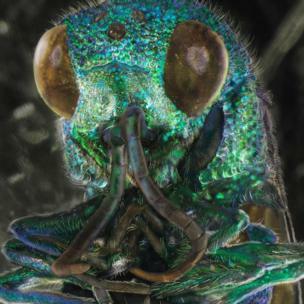 From coffee beans, to blood cells and a fungus-ridden mosquito, an unusual exhibition of science photos goes on display at Newcastle's Great North Museum. 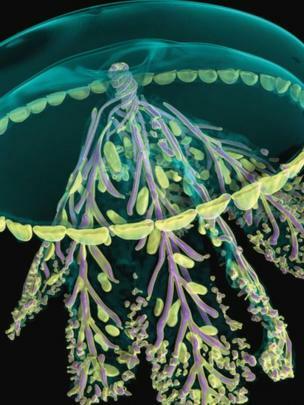 From coffee beans to blood cells, an unusual exhibition of science photos goes on display at Newcastle's Great North Museum from 31 August. This is a Blaschaka jellyfish by Dan Sykes. 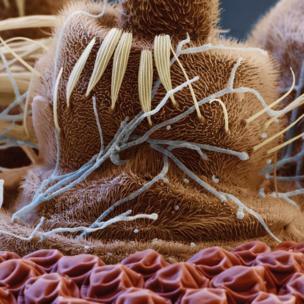 A mosquito antenna infected with the tendrils of a fungus was photographed as part of a study into biologically controlling the spread of malaria - by Nicole Ottawa. 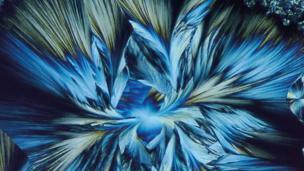 The complex structure of a colourless crystal is revealed in a photograph using polarised light microscopy - by David Mallin. 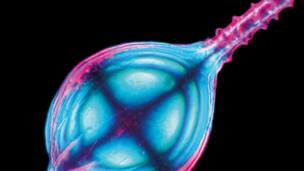 This photograph depicts a red blood cell infected with malaria - the parasite reproduces, grows and bursts dozens of times inside each cell to spread infection by Stephen Morton. A coffee bean is captured on camera during the roasting process, when the bean's oils release the coffee smell - by Nicole Ottawa. 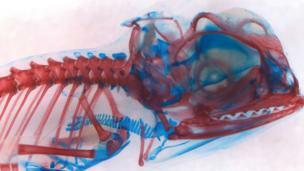 This chameleon embryo's skin was removed and treated with dye - the red is bone and the cartilage is blue. 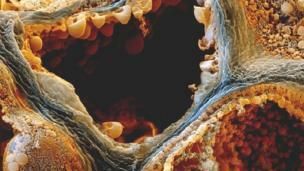 The picture was taken using a Leica dissecting microscope and digital camera - by Dorit Hockman. The sea creature Lagena, which has a hard shell, forms chalk and limestone when it fossilises on the seabed over millions of years - by Spike Walker. 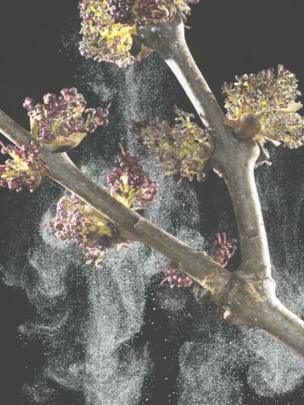 This photograph of an ash tree releasing pollen was taken using a macro lens and three flash units - by Adrian Davies. 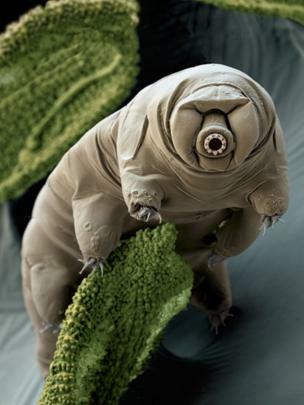 The 1mm-long water bear, pictured here, is a tough little creature that can survive for decades in areas of high radiation by Nicole Ottawa.